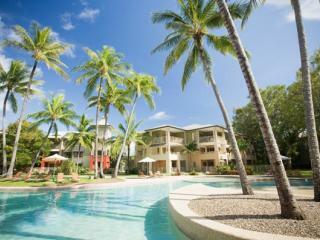 Mantra Amphora is situated on the beachfront at the idyllic holiday destination of Palm Cove. 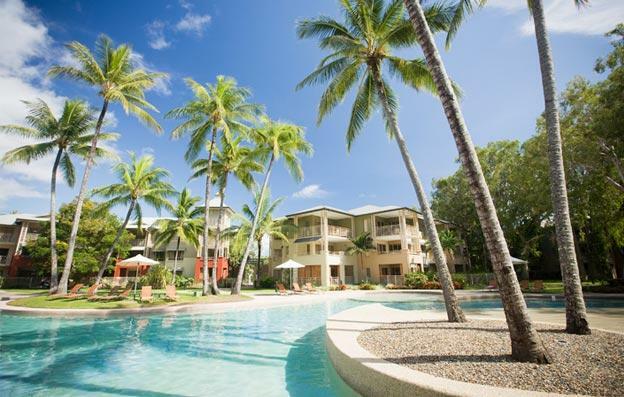 This Palm Cove accommodation is a short half hour drive north of Cairns. Palm Cove offers the charm of a seaside village with the sophistication of world class restaurants, shopping and activities. This Palm Cove accommodation provides the ambiance of colonial South Pacific style architecture and contemporary elegance. Guests have a choice of Hotel Rooms and self contained Apartments, all boasting quality furnishings and premier finishes. Spa baths are available in most rooms and each room features either pool or ocean views. Facilities at Mantra Amphora include the Vivo Bar & Grill, lagoon pool, spa and children's wading pool. Whether you are after action, adventure, rest and relaxation, or fun things to do with the family, there's plenty to do, including Great Barrier Reef and Daintree Rainforest tours, scuba-diving, deep-sea fishing, white water rafting, evening dinner cruises and rainforest walks. Palm Cove, with its village atmosphere, beautiful beach and its close proximity to Cairns, Port Douglas, the Great Barrier Reef and the Daintree, make it an ideal choice when planning your next North Queensland holiday. Accommodation options at Mantra Amphora range from hotel rooms to self-contained apartments all boasting quality furnishings and premier finishes. Spa baths are available in most rooms and each room features either pool or ocean views. Hotel Spa Room: Ideal for short visits, this room features a soaking spa bath and separate shower. Bedding is 1 King Bed OR 2 Single Beds. 1 Bedroom Apartment: Great for couples or friends travelling together, this apartment offers a kitchen with oven, dishwasher, microwave and toaster, laundry facilities and separate living area. Bedding is 1 King Bed OR 2 Single Beds. 1 Bedroom Ocean Apartment: Featuring views of the Coral Sea. Offers a kitchen, separate shower and bath, washing machine and dryer and living area.Bedding is 1 King Bed OR 2 Single Beds. 2 Bedroom Apartment: Offering a great space for families, this apartment features two bathrooms, kitchen and laundry facilities. Bedding is 1 King Bed + 2 Single Beds OR 2 King Beds. 2 Bedroom Dual Key Apartment: Consisting of an interconnecting hotel room and a 1 Bedroom Apartment, featuring two bathrooms with separate bath and showe, kitchen and lounge and dining areas. Bedding is 1 King Bed + 2 Single Beds OR 2 King Beds. 2 Bedroom Ocean Apartment: This loft-style apartment features internal stairs with great views out to the Coral Sea. Offering a kitchen, two bathrooms and washing machine and dryer. Bedding is 1 King Bed + 2 Single Beds OR 2 King Beds. 3 Bedroom Ocean Dual Key Apartment: Perfect for a large group of friends or family, this dual key set up consists of an interconnecting 2 Bedroom Ocean Apartment and a Hotel Spa Room. Features three bathrooms, two with spa baths, kitchen, laundry facilities and spacious living and dining area. Bedding is 1 King Bed + 4 Single Beds OR 3 King Beds. Vivo Bar & Grill: Offers a prime waterfront location and is renowned for its traditional Italian fare and seafood specialties. Palm Cove is also blessed with some of the finest dining spots in Tropical North Queensland as well as small beachfront cafes and restaurants offering everything from casual al fresco dining and family menus, to a la carte fine dining. All of these are located within walking distance of the resort.